We end each year with a celebration. Christmas represents a miracle birth and a hope and a way of treating each other kindly, and Hanukkah–a celebration of a miracle and light- this is a good time to reflect back at the year and see what really happened as opposed to what we hoped would or what we feared would. But don’t do it until you find a quiet moment to reflect. I start my year three times. I use Jan 1, my birthday in March and the beginning of September as moments to pause and reflect and plan. Sometimes I throw late May in there as well. I still find myself on a school calendar. Going back to college right now adds to that feeling. I found myself continuing a productive trend in my business. I made new friends and I lost some to illness and age. My kids grew and faced their own joys and challenges. For me I have continued to try to be the best mom I can be to them while supporting them to live independently and make wise decisions. I had friends go through difficult times that I couldn’t help them out of and I found myself creating things and dealing with the frustration that comes from not having enough hours in the day. This quote is one that began my blog in October of 2009. I found it on the wall in a university science lab. Just a few months later I found a lump in my breast and started on a journey of discovery both physical and spiritual. 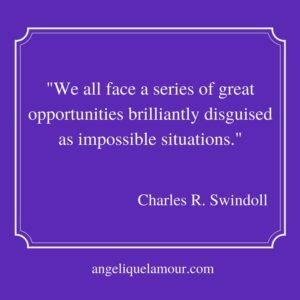 What impossible situations have you found yourself in? And what great opportunity did they reveal to you? Share in the comments, please. I write, to help others, to entertain and to lift people up when they are down. None of that was born of that experience but all were spurred onward by it. That year I accomplished a number of things never dreamed of on Jan 1. This year, too, I have accomplished things I planned to and found other things to accomplish as the year went by—I stayed flexible and met those goals as well. Did you accomplish what you set out to or did you find completely different things needed to be done? It is important that, as we make plans, resolutions, goals, we remember that the year may have other plans and our goal is to ultimately move forward without getting stuck and to lead and guide with love and compassion. Much happened this year that made us look within to our core beliefs. Be heard this new year and be brave and reach for those great opportunities.